My bad Darkstar, it is true that I should have taken more time reading every articles instead of just looking at the picture, My apology for not being more cautious. Then I look at your response for a second and it is full of should, would or "most likely". Am I right by saying you can't prove anything either? Did you see the footage regarding the black box? The main thing coming of your post is "I think", "I remember", "I am"....a lot of "I" but not many facts. Lets make it VERY simple for a second; Where is all the footage? Why is it being held by the FBI and CIA or whoever since we can't prove who got what? And while we are at it, why do you have a problem against such post UrbanMarine? you get offended ? Why did you have to bring politics and religion into this?!?! But I will stop right here because as Zero said, the link Locutus posted is quite nice. Lot of good and bad information and at the end, no one seems to be able to prove one way or another and since we (those not believing it is a plane at 100%) are not the one saying for sure what it was, it irrevocably means you (the one saying for sure it was a plane) needs to show us, the laughable people, everything to know about these planes. So at the end, either your theory is bad or you prove us wrong and we accept it. I am fine with that. Honestly, reading some of this rhetoric made me dizzy.... people died, i saw it live, and i got PISSED.... leave it alone i say. I will back Dark and say it was a plane. i've got some expirience in film and editing, the gate cam shows a plane, and it is true. they disintegrate on impact at those speeds. and a cruise missile does not take lamp posts down with a rough gap of 75-100 between each one. Blade, when the VAST majority believe it was a plane and common sense says it was a plane, I think the burden of proof is on the tin foil hat wearers. So far they have come up short. I think this is the whole beauty behind all this. You have a story, you create a theory, you create an anti-theory, you let people go at it and you get to a point where nobody knows anything....and the subject get dropped. What is truly funny is when I will find out I was wrong, my ego will be bruised, I will walk my head down for awhile and then move on. BUT for those who believe in what they are told, the day they find out it is all wrong, their universe crumble and they can't live anymore. At the end, until someone start replicating the whole thing, we will probably never know the truth. Well, I feel I don't need to prove anything because all the proof you need is already out there. It's all been said. It is not my job to spoon feed it to anyone. The reason I may have said "I think" or "I remember", etc, is because I personally remembered certain things that I personally saw on the news the morning of 9/11. I was watching the news as it happened, and unfortunately remember it quite vividly. If I thought about something, it was in context to my personal observations and predictions about what I know about aircraft and aviation and what would happen to a plane hitting a building at high velocity. I'm just discussing the topic and explaning my reasons for beleiving that the conspiracy theoriests are a bunch of whackos. I don't need it to be proved to me any other way. I know what happened, and I find it unfortunate that others either can't see the truth or they fail to believe it. What is your point about the black boxes? They were found on September 14th, and I think it was sometime between 2005 and 2007 that it was further investigated by airline pilots who under instructions, attempted to disprove that a plane had hit the Pentagon. They couldn't. I honestly don't know why people choose to believe in these conspiracies. I guess I'll just put it down to my logical thinking compared to people wanting to believe in something more. I didn't bring up religion, but I felt the Holocaust conspiracy was relevant because there are people out there who also say it didn't happen, even in the face of insermountable proof that it did. What do you say to them? I don't have a story or a theory, I have what actually happened. Flight 77 was hijacked and deliberately crashed into the Pentagon on 9/11 and 184 innocent lives were lost. People phoned their loved ones from the plane and told them the plane had been hijacked. There are numerous parts of the plane strewn across the impact site. There are hundreds of eye witness accounts saying it was a plane. 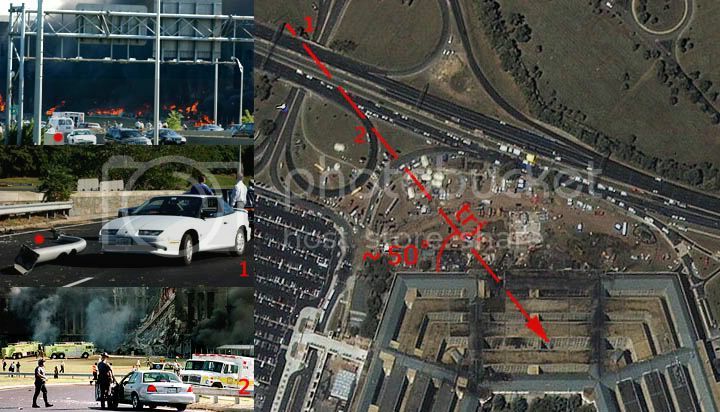 This whole "it wasn't a plane" theory is just silly, and it makes those who believe it look silly. Well, I'm not sure what exactly disappeared. Except for what the conspiracy theoriests want swept under the rug to support their theories. But I don't see any reason for your ego to get bruised over something like this. And even it these theories were true, I'd hardly cause it a reason not to live anymore. As far as replicating aircraft accidents, there have been plenty of crash tests done on airframes to determine their survivability in crash situations, and it's really shocking how delicate aircraft really are from the results of these tests. Many are viewable on YouTube and other aircraft related websites. I'm sure that if a cruise missile had hit the Pentagon, there would have been much different damage, likely much more focused and precise. As such, I don't believe that was the case. Well, there are a TON of videos, photos, witnesses, archives, facts that have been given to prove the holocaust happened. We can't say the same for the 9/11 events without a doubt. there are simply too many "hidden" things out there. Not saying they are purposely hidden or wrong, it is just not available to the public. Your theory and mindset Darkstar is the same than those believing in UFO: they saw it on TV or in the sky so it must be true....even if we NEVER really got any physical evidence shown on TV proving it. p.s. the religion example was just to prove the "mindset", not to approach theology at all. Now, Seriously, we are obviously going nowhere with that kind of thread so if Red locked the other thread, what are we waiting to lock this one as well? there are a ton of other website discussing in depth about this with much more information and experience than we could ever dream. Or until you one day discover that you have insulted someone who lost a loved one in this tragedy by portraying a truly ignorant point of view. I haven't lost anyone to this event, but I do know people who had family members in the towers and I know I would never want to step on their toes. No one should ever admit that our government is by no means a perfect entity, but to me insinuating foul play to instigate a political gain of this magnitude is quite unreasonable. Everyone wants to believe in the sensational, its the reason yellow press exists. But to border paranoia is a fine line between logic and insanity. I believe the phrase "question everything" holds universal truth, but to me there is only one answer to this. People died in this viscous attack. Everything here boarders a sharp political debate seeing as it is closely tied with U.S. foreign policy. Brian I know you have taken part in the conversation so far but I but I respectively ask that it is time to shut it down. Spectre, I don't think such subject in this forum has anything to do with losing a loved one in the same way, it should not involve political or religious views. While some might want to close their eyes on all this, others might want to hear the truth. Finding the answers doesn't diminish in any ways the tragic lost that day or any other days afterward. Even if you're not convinced by the bare evidence, think about how many thousands of people (yes, thousands) would have to be part of this cover up? You have eyewitnesses, engineers and techs who provided the information, intelligence analysts, airport control staff, the families of the "deceased", government panels, I could go on forever. If it was a conspiracy, someone would have screamed bloody murder. By saying its a conspiracy, you are accusing the ENTIRE UNITED STATES GOVERNMENT of killing its own people. This would mean DEMOCRATS AND REPUBLICANS working TOGETHER?! That alone discounts your entire theory. Point is: there is no possible way that something of the magnitude you speak of could be kept quiet for this long. Even under a possible threat of death, some hero would have emerged already. And if you're completely lost to the nut house and still think its a conspiracy...well I would start giving up all hope now and just retire. If the government could pull this off, we're all screwed. Hola Boundy, I think we are taking this topic to a whole new level, which I don't think it is the appropriate place to discuss. This topic was supposed to be about airplane crash, nothing else since politics and religions are prohibited. I admit, we went a bit too far once again. Wait, I thought we were talking about an A10 crash? Agreed, to each his own. My existing is also a conspiracy theory. I'm just haunting an IPad. (21:42:57) Agent_Spencer: I mean i didn't need a pony made of diamonds, but I have a yolo card. Blade, there's really nothing political about the fact that a plane hit the world trade center. And when I brought up the Holocaust, it had nothing to do with the religion of the Jews, my point being that millions were killed and there are mountains of evidence that fully supports that and yet there are still people, like the leaders in Iran and others, who deny it ever happened. 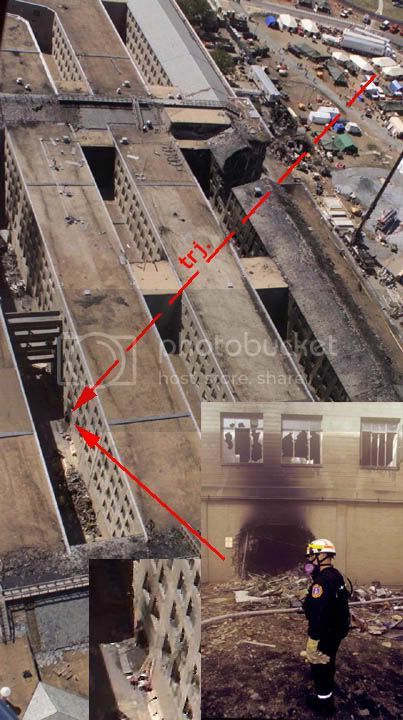 In the case of 9/11, thousands of people saw Flight 77, which was the American Airlines flight that hit the Pentagon. Hundreds of people actually saw it hit the Pentagon. multiple news agencies immediately reported the crash. The plane actually hit a car that was driving down the street in front of the Pentagon, including wiping out a bunch of lamposts in the process. Now look at the security camera images. Now whatever you think is in the first frame, it is DEFINITELY bigger than a cruise missile. And whatever it is, it is huge. It definitely looks the size of an airline jet to me. Security cameras usually are not that great at image quality, and often blur fast moving objects. It's not illogical to realize that a jet plane travelling at an estimated 350 miles per hour would be blurred. Here's a link to quotes from people who actually saw the plane hit the Pentagon, with links to their relevant news posts, interviews, etc. You can't say that all of that information is completely false Blade. Sorry. Maybe you should read this link as well. If that doesn't clear it up for you, I don't really know what will. I agree, the holocaust definitely didn't happen.